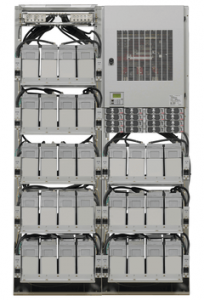 The modular Emerson NetSure 710 power system with 3000 watt rectifiers and 1500 watt DC to DC converters provides up to 2000 amps of current for +24 volt systems with up to 500 amps at –48 volts. The NetSure 710 system is ideal for wireless applications such as cell sites, co-location, huts and large vaults or enclosures. The basic components of the power system include the ACU+ control unit, module mounting shelf assemblies which house the rectifiers and converters, and a modular distribution cabinet. The NetSure 710 power system contains a powerful, microprocessor-based control system capable of monitoring and controlling up to 32 rectifiers and converters. The ACU+ controller provides a 4×16-character alphanumeric display, which can be activated at the touch of a keypad. Each shelf can accommodate up to eight plug’n’play rectifiers or a combination of up to eight rectifiers and converters (max of four converters per shelf), which are controlled by the ACU+. Additional shelves can be added as load requirements increase. NetSure 710 50 kW 2000 A +24 VDC 208 VAC to 240 VAC 84 in. standard 23 in. Mounting 20.1 in. 200 lbs. to 650 lbs. For more in-depth information, see the NetSure 710 brochure.